Low water pressure is a frustrating issue that can impair your ability to perform a variety of personal care tasks and household chores. While some municipalities reduce water flow to conserve vital resources, several factors inside your home could be also responsible for the diminished pressure. A professional plumber can troubleshoot your system, identify the issue and correct the problem. If the low pressure only occurs in one fixture, the problem could be due to a clogged aerator. This component mixes water with air to prevent splashes as the water flows from the fixture. You can remove and clean the aerator to eliminate calcium, lime or other mineral deposits that diminish water pressure. Remove the shower-head or faucet aerator with a pair of pliers. Remember the alignment of the parts to ensure that you properly reassemble the fixture. Use caution to avoid scratching the finish. Clean the aerator by soaking it in a lime cleaning solution or white vinegar for several hours and then use an old toothbrush to remove the surface buildup. Check your home’s water pressure regulator. This device is usually located on the main water supply line to your home. It can be located in a utility closet, basement, garage or inside the box containing your water meter. Turn on an outside faucet or sprinkler so you can gauge the pressure. Loosen the retaining nut on the regulator with a pair of pliers. Use a screwdriver or your hand to turn the pressure adjustment stem clockwise until you have sufficient pressure. Tighten the retaining nut. Some older houses have low water pressure because their pipes exceed the modern standard of ½-inch diameter. Installing a pipe reduction device can improve water pressure. 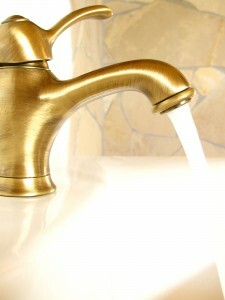 Clogs and leaks can lower water pressure. Over time, rust, sediment and mineral deposits can accumulate inside your pipes and impede water flow. The only effective solution for this problem is replacing the occluded pipe. Leaks can lower pressure as well. This problem requires immediate attention to prevent water damage, expensive water bills and pest infestations. While cleaning a shower-head or a faucet aerator is a common do-it-yourself project, replacing pipes and installing fixtures are tasks best left to a professional. A licensed plumber has the tools and expertise to diagnose and promptly correct low water pressure problems.